Friday evening, the Ducks experienced a blow to their recruiting momentum. 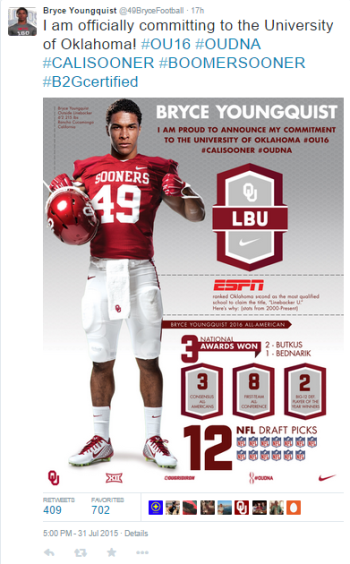 Highly-recruited four-star LB Bryce Youngquist committed to the Oklahoma Sooners despite saying in June there was a “90 percent” chance that he would commit to Oregon. This comes on the heels of Oregon narrowly missing on many of their top linebacker targets in the class of 2015. More recently, in addition to missing on Youngquist, highly-ranked linebacker recruits Camilo Eifler committed to Washington and Chase Claypool committed to Notre Dame over the Ducks. Bryce Youngquist became the latest highly-touted LB recruit the Ducks narrowly missed. 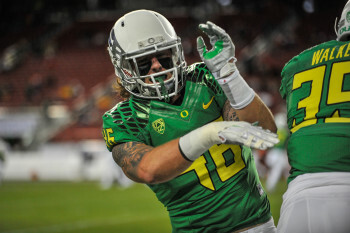 Oregon’s linebacker recruiting efforts have faced some difficulty for a couple of years now. Oregon’s 2014 recruiting class included only one linebacker, Jimmy Swain, a four-star recruit. Additionally, some of the highest-rated and most promising linebacker recruits at Oregon have left the program in recent years. Anthony Wallace, a highly-touted four-star linebacker recruit, left as a sophomore in 2013. Prior to last season, former four-star linebacker recruits Brett Bafaro and Tyrell Robinson left the program, as well as the promising young linebacker Oshay Dunmore. These defections have played a role in Oregon’s linebackers play leaving something to be desired over the last couple of years. 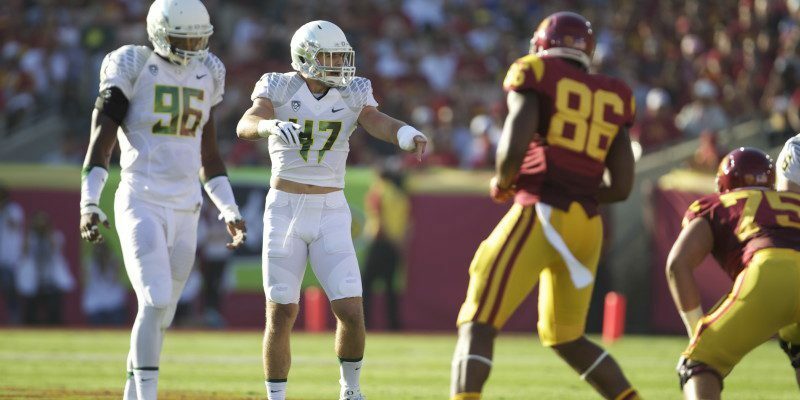 However, there is reason for optimism that the Ducks can turn things around for the linebackers both in the short run and the long run. Defensive Coordinator Don Pellum is now in his second season in his new role and, feeling more settled, should benefit from having a year under his belt. Second-year linebackers’ coach Erik Chinander should also benefit from the experience he gained last year. Additionally, Oregon welcomes back a strong group of experienced linebackers at all four linebacking positions. Derrick Malone and Tony Washington will be missed, but Joe Walker, an honorable mention all-Pac-12 performer last year, has plenty of starting experience to take over for Malone, while Christian French and Torrodney Prevot have a wealth of experience and talent to replace Washington. This year’s group of linebackers likely won’t be at the same level as some of the groups that played from 2009-2013, units that were full of future NFL draft picks and all-Conference performers. Nevertheless, this squad should be improved over more recent ones. The future looks even brighter for the 2016 season and on. Last year’s underclassmen including Jimmy Swain, Danny Mattingly, Johhny Ragin, Torrodney Prevot, and Justin Hollins have all seen meaningful game experience. Additionally, each has shown that they have the tools to be special the next few years after the current group of seniors move on. There is still a lot of growth and development needed for them to reach the levels exhibited by past Ducks linebackers, but the tools are there. Additionally, despite losing out on a number of linebackers this year, the class of 2016 has some promising young talent already committed. The top recruit in the state of Oregon, four-star OLB recruit Lamar Winston, and highly-touted four-star ILB Darrian Franklin have a ton of potential. Additionally, Oregon is still in the mix for a couple more linebackers in the class of 2016 including five-star prospect Caleb Kelly. Danny Mattingly, “Kiko 2.0,” is looking to have a breakout year this fall. Coaches Chinander and Pellum will need to step up their game in recruiting linebackers to enable a sustained improvement at these positions. Oregon has finished runner-up for a number of linebacker recruits recently. The added experience both coaches now have in their new roles should help in the recruiting wars. Coaches Chinander and Pellum will also need to figure out how to turn more under-the-radar three-star recruits such as Casey Matthews and Kiko Alonso into elite linebackers. Danny Mattingly, sometimes referred to as “Kiko 2.0,” is poised to be the next three-star recruit that becomes an all-Conference performer and NFL draft pick. A combination of transfers and dismissals, defensive coaching changes, and finishing runner-up on the recruiting trail has hampered Oregon’s linebacker corps the last two years. The Ducks, however, appear to be moving things in the right direction at these crucial positions. Duck fans should feel confident that Oregon can regain the elite linebacker play on the field that was the strength of the Ducks’ defense in years past.